Welcome to my little Alt Army. It is not every character I have ever made nor is it all the max level characters I have but it is the most played lot of characters I have and every one of them resides on Argent Dawn EU. Before Legion I had a plan to do a full roster of Alliance and Horde on separate servers. I already had all twelve Horde characters. The only thing they really needed was some detail work to get them all to max profession levels and a little bit of gearing to make Legion levelling a bit smoother. With how easy and fast levelling was at the end of Warlords of Draenor I was able to create the full Alliance roster in no time at all setting me up with 22 characters in all. After the base levelling and while I was outfitting and sorting the professions of the Alliance crew a mind shift happened which I will detail more in My WoW Story. At some point I decided to change factions for Legion and put all my efforts into the Alliance crew. 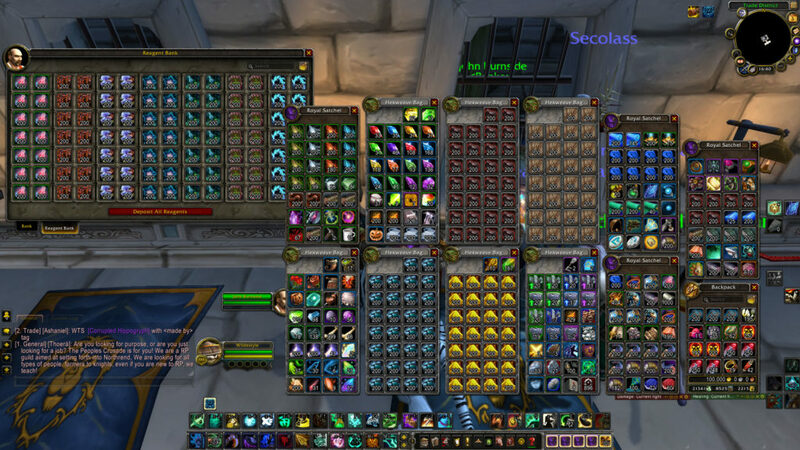 I even deleted a couple of the max level characters to make room for a faction transfer from my Horde server loaded with as much gold and goods as they could possible carry. 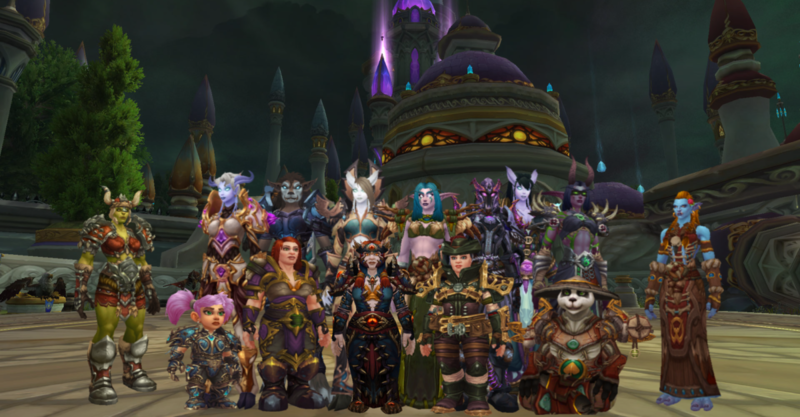 All my plans were set and the Legion pre-launch event afforded me a great chance to gear all the alts. Then it all changed. A dear Horde friend said he was returning to WoW and starting a guild. I couldn’t say no. For me playing with friends is far more important than anything. So I deleted six of my freshly maxed level, max primary and secondary profession characters. I resolved to fresh create three of the new Horde characters and wait till Legion to worry about their professions and gear. I also faction transferred three other Horde characters. With the rather large upheaval done I entered legion and have had a brilliant time playing with friends and experiencing all Legion has had to offer. Yet through it all a nagging feeling was always there and despite my drive to play with friends I could no longer resist and made a decision to play Alliance fully in Battle for Azeroth and beyond. To facilitate this I turned to my alts and made them into my own little Army. I levelled them all pushing myself to complete full quest lines and order hall objectives across them all. All to get their Class stories, Mounts, followers and gear item level to 920+. When that was sorted I pressed the Army into service. Their marching orders were to acquire as much gold as possible. I pushed the followers on all twelve characters to ensure they could get to item level 950 and have one gold item kitted follower for a bonus 125-150 gold per world quests. When Allied races came out I added two more characters to the Army to round out my plan. Quickly they were brought up to speed then I systematically began a daily run of all fourteen characters completing every emissary quest, every gold mission board quest and any world quest over three-hundred gold. 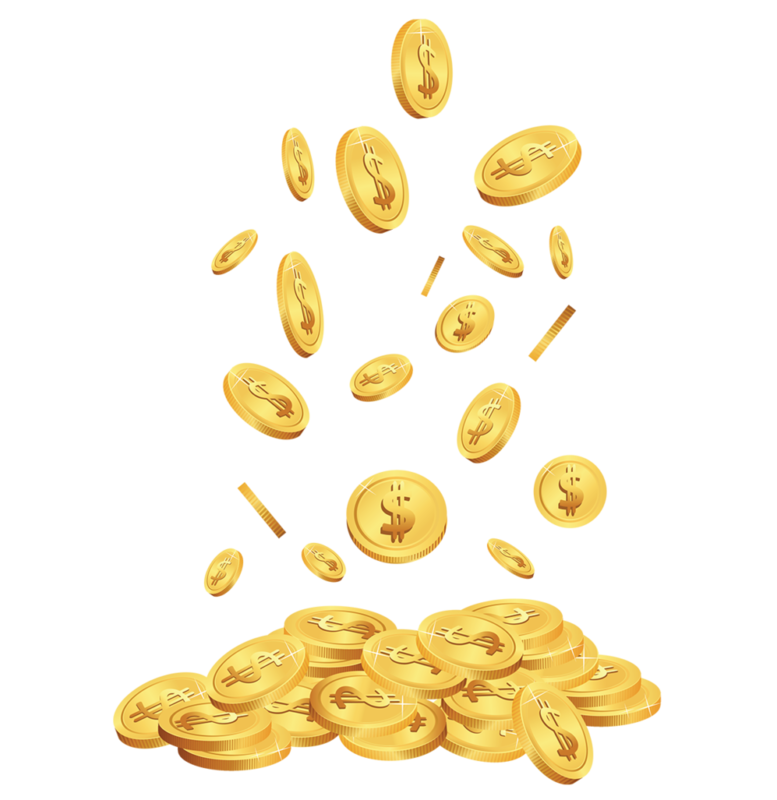 Within two months the Army had done their job well amassing a total of over five million gold. I instantly converted that to Blizzard balance to stave off inflation. With the gold they made I was set to afford a mass transfer to Alliance. As of this writing four of the five will have been done with just one waiting for her scoundrel trousers from Imonar to go. Going forward I plan to bolster the Army with a full treatment to their primary and secondary professions before Battle for Azeroth. I was quite impressed with how much brute force gold they could make in Legion. My hope is to further refine them and see if they can make me more with a bit less effort moving forward. I am so happy I did this personal challenge of sorts as it helped me to get a better understanding of each class’s strengths and weaknesses. It was all a little tiring and stressful at times but ultimately something fun I can look back to in Legion as an amazing adventure. Three Cheers to the Alt Army!